IF YOU’VE BEEN EXPERIENCING regular headaches, neck and shoulder pain, or persistent ringing in your ears, we may be able to help. These are common symptoms of temporomandibular disorder (TMD). Complex joints called temporomandibular joints (TMJ) connect your jaw to your skull. Properly aligned, these joints make it possible for us to chew, swallow, and talk. If these joints are out of alignment or not synchronized with your jaw, it can lead to serious, often painful, issues. Problems with your TMJ, jaw, and surrounding facial muscles can lead to temporomandibular disorders (TMD). These problems can be caused by undue strain on your TMJ and jaw (often a result of teeth grinding, trauma, or stress). We use several methods to diagnose TMD, including 3-D bite records and joint imaging. We also use a Doppler, which is an ultrasound to evaluate jaw joint sounds and problems. We have several trial appliances that can give you immediate relief from your pain. 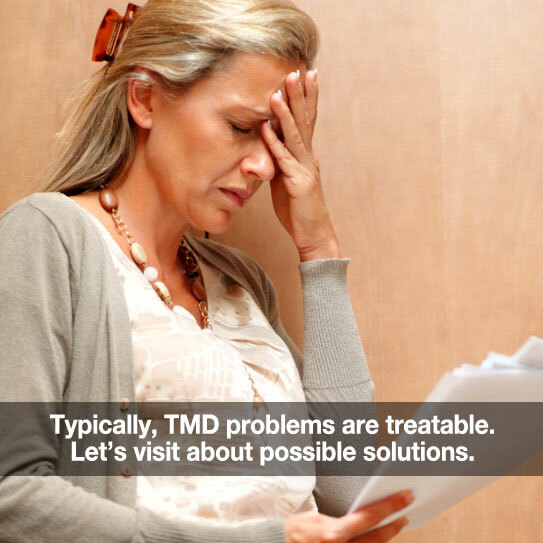 We see lots of patients that have various levels of TMD. We have had one patient sit up in the dental chair with tears in her eyes and tell us “that she finally had her bite back”. She has had wonderful results and has been pain free for 10+ years. Another patient told us that her new night guard (occlusal guard) was like having a massage while she was sleeping because her muscles were so relaxed. Many other patients have reported elimination of clicking, popping, and headaches. Typically, TMJ problems are treatable. The best way to avoid complications is to visit with us at the first signs of concern. The sooner you start appropriate treatment, the sooner you’ll find relief. Call us today! Thank you for trusting us with your oral health! ← The Buy One, Give One Toothbrush… Bogobrush!